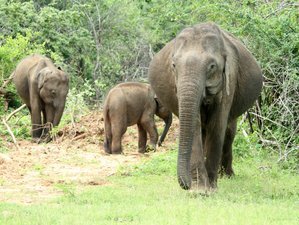 This tour covers two of the most important eco-tourism hot spots in Sri Lanka, Belihuloya, and Yala where you can explore much more than a simple nature lover can experience. The luxury and unique accommodation options available in both these locations will add more value to this tour that anyone will want to experience. Nature trails, waterfall trekking, game drives, and unique dining options will create more inspiring experiences with wonderful photogenic opportunities. In this wildlife tour, you will be accommodated in the Glenrock Resort and the Leopard Nest. Hidden amongst a mountainous farming village and nestled by the World’s End and Hagala Mountains, the Glenrock rests on the banks of the Belihuloya River. With a handful of high end luxury suites and rooms, and a range of complimenting activities; a stay at the Glenrock will leave you refreshed. With mind, body and soul rejuvenated; the natural surroundings of the hotel breathe new life into you. Balancing a blend between a luxury suite and an eco cabana, complete with a rustic wood paneled finish, nestled within the woods and in close view of the flowing river the Jungle suite is ideal for nature lovers. A room especially catered to the nature lover. The jungle suite II is amongst the thick foliage of the jungle and overlooking the Belihuloya River. Immerse yourself in the environment and in the silence of nature as you discover the rich flora and fauna of the Glenrock eco system. The mountain view suite comes complete with a king sized bed, a spacious bathroom with a single Jacuzzi, and an open outdoor sitting area. The suite offers an exquisite view of the Horton plains mountain range and the streams of the Belihuloya below. The area also commands a view of the night time skies – ideal for stargazers. The suites are located adjacent to each other, thus making it perfect for families. The generously sized mountain view modern suite offers a luxuriously furnished King sized double bed. The outdoor deck is furnished for lounging and relaxing (suitable for reading or even star gazing at night). The suite overlooks both the Belihuloya and the Horton plains mountain rage. The room also overlooks the in house organic farm of the hotel. Since both the mountain view suite and garden suite are located in the same building, it would be ideal for families. For wildlife travelers who seek luxury glamping experience, the Leopard Nest is a unique campsite that returns the true essence of an ultimate glamping experience with elegance, romance, and adventure while minimizing the environmental footprints. They make the difference in the wild and provide authentic wild experience with large tents and nests that are unique in design and exclusive in comfort. Overlooking the green forest with a distance view of the Indian Ocean, the tree nest provides a unique experience to the guests. This unit consists with one double room and opens deck that gives an enormous opportunity to enjoy the nature whilst enjoying the comfort of a tree house nest at an elevation of 22 feet above the ground level. Surrounded by thick bushes with a shade of a large tree, the jungle nest provides a real jungle glamping experience to the guests. This unit consists with a large bed room with enough space to include an extra bed and a large deck to enjoy the glimpse of wildlife. Overlooking the green forest with a distance view of the Indian Ocean, the sky nest is located at the tip of the trees surrounded by the thick forest. This unit consists with a large bed room with enough space to include an extra bed and a large deck that provides an opportunity to enjoy the aerial view of wildlife. Surrounded by beautiful thick bushes and nice trees that provide enough shading to enjoy the natural breeze, the family tent provides an exclusive glamping experience to the guests. This unit consists with Large Bed room, living room, en-suite bath room and a large deck that gives enough space for a family to enjoy the wildlife with more comfort. Overlooking some beautiful landscapes and thick bushes, luxury tent provides a comfortable luxury glamping experience to the guests. This unit consists with a large bed room and a large deck enabling the clients to enjoy the surrounding environment whilst reading a book from the library. 07:30 You will be picked up from your hotel (inquire for the departure points) and driven approximately four hours to reach Belihuloya. 12:00 Arrive at Glenrock Hotel and check in for lunch. After lunch, you will enjoy the surrounding of the hotel and spend couple of hours at leisure. 18:00 Arrive back at your hotel refresh with warm water shower before enjoying your barbecue dinner at roof terrace or by the river. Spend the overnight stay at Glenrock Resort. Wakeup early in the morning and experience the sunshine over the mountains whilst discovering the wonder of nature surrounded by the hotel. 07:30 Enjoy your breakfast at the hotel restaurant. 08:30 Your guide will take you through another memorable walking trail to Pahantudawa Falls, a marvelous creation of nature in a mini canyon like geographical setting nowhere can be seen in Sri Lanka, located about 1.5 km from the hotel (involves a somewhat adventurous, challenging short climb walks). 10:30 Arrive back at the hotel and get refreshed before leaving to Yala. 12:00 - 13:00 You will enjoy your lunch at a local restaurant on the way to Yala. 15:00 Arrive at Yala Junction where you will start your evening game drive at Yala National Park to experience the wildlife treasure in one of the best homes for leopards and other animals in Asia. 18:30 Check in to Leopard Nest Campsite and enjoy your private alfresco shower followed by drinks and appetizers around the campfire. 21:00 Dinner will be served at one of many locations available through the camp. Dine under the stars for an unforgettable evening meal in the jungle experience. Stay overnight at the Leopard Nest. Wake up at dawn around 5:00 a.m. to freshly brewed Ceylon tea or coffee. Then leave on morning game drive at 5:30 a.m. Return from morning game drive at 9 to 10:00 a.m. to freshly squeezed juices from seasonal fruits followed by breakfast. You will check out at 11:00 a.m. and be transferred back to your hotel. This tour will take you through Belihuloya and Yala National Park. Yala National Park is situated in Sri Lanka’s dry zone, made up of scrub jungles, water reservoirs, brackish lagoons, and riverine habitats. It has the highest population density of leopards in the world, and is also home to a herd of 300 to 350 elephants. As well as leopards and elephants, keep an eye out for animals including sloth bears, black-napped hares, spotted deer, sambar, hanuman langurs, toque monkeys, stripe-necked and ruddy mongooses, wild boar, and golden jackal. You may also see the enormous land and water monitors and, of course, marsh crocodiles. Two dinners, two lunches, and two breakfasts with a barbecue dinner at the Leopard Nest will be provided. Wine and beer at Leopard Nest are also included. Vegetarian option for the meals is available, please advise Beyond Escapes at time of booking if required. Please book your flight to arrive at Bandaranaike International Colombo Airport (CMB). Airport pick up will be arranged based on your flight details. Airport: Bandaranaike International Airport Airport transfer included: Bandaranaike International Airport No additional charges. You can request this in the next step. Beyond Escapes (Private) Limited is a specialist Destination Management Company located in Colombo, Sri Lanka.